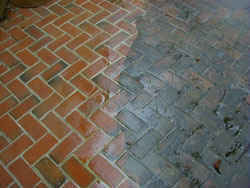 Thinking of re-newing that tired looking patio or driveway? We can transform it for you at a fraction of the cost. Most surfaces over time will darken and even get covered in moss and algae, especially when not in direct sunlight. This is not only unsightly but also can be quite dangerous when wet, this is because the moss and algae become incredibly slippery causing thousands of falls every year in the UK alone. Whether you are a company that wants to improve the first impressions of your offices, and reduce the possible risk of slips and falls, or if you are a homeowner that wants to give your property a fresh look. We can give you a great service at a price you can afford. If you are selling your property, having your driveway and paths cleaned will give your house a great new look, and hopefully be a great help in the buyer choosing your property over others.